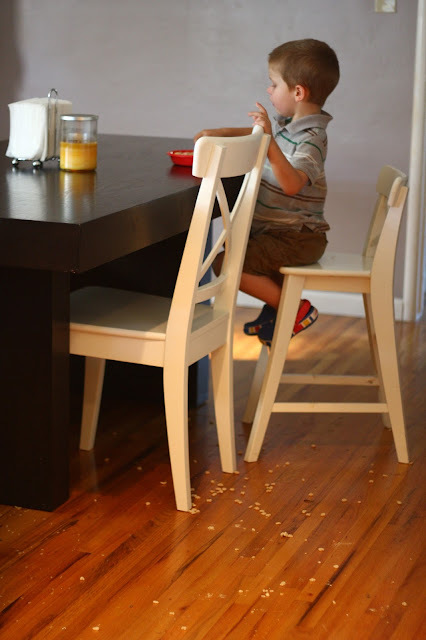 That cereal mess you see on the floor is only about 1/8 of the cereal that ended up on my floor from Connor deciding to get his own cereal...and milk wasn't even included in the mess. But all the cereal in the box (the box was about half full) ended up on the floor. It happened in the kitchen, so I am unsure how it ended up all over the dining room floor as well. And before I got the chance to clean it up, both kids traipsed through it a couple times. You know, just to help mom out a little. It's on days like this (and mostly every day of the year) that I am glad we don't have carpet.